Booooooo! Hi there, you are reading my newly official food column, Skye’s scran for SCAN. I have kindly been given a regular column by the SCAN Lifestyle team, which means every issue I will be writing about food for you. So if you are a foodie, be sure to pick up a copy of SCAN every fortnight and read my column! So, I have a question for you: do you know what ghosts eat for dinner? I can imagine a few of you slow clapping… Anyhow, cheesy joke aside, as you probably know, this Saturday is Halloween. For those of you who enjoy a bit of culinary history here’s a very brief background to Halloween gastronomy: Halloween originated from the ancient Celtic festival known as Samhain and evolved into a Christian festivity. As Western Christian denominations encouraged abstinence from meat on All Hallows’ Eve, it led to the tradition of eating certain vegetarian foods, specifically apples, cider, kale and soul cakes, to name a few. For this week I have cooked up quirky yet traditional inspired Halloween recipes that are still suitable to serve at your fangtastic Halloween party. The recipes definitely aren’t challenging to make, so please do have a go at making them! Unfortunately, I haven’t had the pleasure of going to Hogsmeade to taste legit Butterbeer… However, I have done detailed research and this recipe is the easiest for us Muggles to make. Fill your glass with cream soda and stir in about 1 tablespoon of butterscotch sauce for every 150ml of cream soda. If you want a boozier Butterbeer pour in some rum (to your tastes) now. Stir the contents of the glass to combine. Now fellow Muggle, enjoy your delicious homemade Butterbeer! I can’t think of a drink that embodies autumn better than mulled cider. It is a warming, spicy drink and also super easy to make. So give the recipe a go! Pour the cider into a large pan on a low heat and let it warm up for several minutes. Throw in all the spices and juices, and turn up the heat. Once the mixture is boiling, turn down the heat to a simmer and leave for 8 minutes. Lastly, add the sugar, and ladle your delicious concoction into waiting glasses. Enjoy! Colcannon is an Irish side dish mainly consisting of potatoes and kale or cabbage. It was traditionally consumed during Halloween and small prizes were concealed in it. However, I think it’s great side dish to eat all year round. Peel the potatoes and cut them into eighths. Place them in a large pot and cover with cold water by about an inch. Season the water with 1/2 teaspoon of salt. Bring the potatoes to a boil, then reduce the heat and continue to simmer for 15 to 20 minutes until fork tender. Drain the potatoes, then cover with a clean dish cloth and the lid of the pot. Melt 2 ounces of butter in a large frying pan. Add the minced shallot and sauté for 2 minutes. Add the chopped kale and cook for 3 to 4 minutes until wilted. Add the spring onions and cook for 2 more minutes. Mash the potatoes. Add 2 ounces of butter, the half and half and the wilted greens to the potatoes. Mix them through the potatoes with a masher. Serve hot in bowls or as a side. Make a well in the centre of each serving of colcannon. Place a knob of butter to melt in the potato well. Okay when you think of a witch, the words comforting and warming probably don’t spring to mind but this soup definitely is just that! This soup embraces the abundance of pumpkins in autumn and is simple to make in your cauldron/pot. Its magical warming effect will make you smile. Heck, you might even let out a witchy cackle! Heat the oil in medium sized pan, add onions and cook for about 4 minutes, or until translucent. Add the pumpkin puree and cook for 9 minutes, stirring occasionally until the mixture is brown. Pour the pumpkin mixture into a large pot and pour in the stock. Bring the mixture to a boil and then simmer for around 8-10 minutes. Now, add the cream and bring the pot back to the boil. Finally, season to taste, sprinkle parsley on top to garnish and serve up your bewitching pumpkin soup. I think it’s safe to say pizza is the stereotypical student dinner (and sometimes breakfast…). But instead of ordering from Domino’s for your Halloween dinner party, why not try this simple inexpensive and quick pizza recipe? You’ll certainly have your friends talking about your cool looking creepy crawly pizza! This recipe is for one pizza (which can feed two or a very hungry person), so multiply it to fit the number you need to feed. Preheat the oven to 230°C. Then place the pizza on a baking sheet and top it with the sauce. 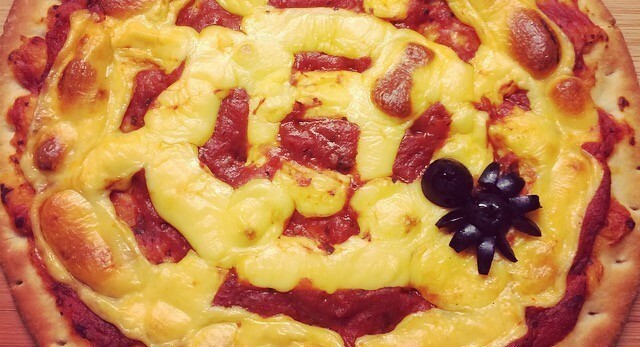 Cut your cheese into thin strips and place it on pizzas in the shape of a spider’s web. Next, bake the pizza for 8 to 10 minutes, or until the cheese melts, and then leave to cool for 3 minutes. Cut the olives to make the body of spider and place it on the pizza. Tadaa, your pizza is done! Mhhmm these cakes have soul dude! I jest, they don’t have souls but they are simply yum. Soul cakes were actually the original trick or treat goodie! Traditionally during Halloween, children and the poor would perform or say prayers to earn soul cakes. Now I think these cakes are a lovely to enjoy on any autumn evening with a warm cuppa. Preheat the oven to 220°C and grease baking tray. Sift the dry ingredients into a large bowl. Then rub in the butter and mix in the sugar, currants and sultanas. Make a well in the centre of the bowl and add the egg and milk, mixing until the mixture is firm. Then use a spoon and fork, to spoon the mixture onto the baking tray. Bake the soul cakes for 10 to 15 minutes. Your sweet tooth will love this seasonal treat! The crunch and sweetness of a toffee apple is devillicious and arguably there isn’t a yummier way to eat a whole apple. I know you can easily buy this in shops, however the flavour of this homemade version is far superior. Place the apples in a large bowl and then cover them with boiling water. This will help remove the waxy coating on the apples, which will allow the caramel to stick better. Scoop the apples out of the boiling water, take care, as they will be hot. Then, dry the apples thoroughly, twist off their stalks and insert a wooden skewer into each apple. Then lay a sheet of baking paper near your stove and place the apples on top. In a pan with 100ml of water, pour in the sugar and dissolve over a medium heat. Once the sugar dissolves (it should take around 5 minutes), stir in the vinegar and syrup. Place a sugar thermometer in the pan and boil to 140°C. If you haven’t got a sugar thermometer, don’t worry! You can test the toffee by pouring a little into a bowl of cold water. It should harden immediately and, if you remove it from the water, it should be easy to break. If the test toffee is still squishy then continue to boil it. Now you must work quickly! Dip and twist each apple in the hot toffee until it is completely covered, and then let excess toffee drip away. Lastly, place the toffee apples on the baking paper to harden. If the toffee’s temperature drops, you may have to heat it a little until it starts to feel thick and gooey again. Let your toffee apples cool before eating.